Family Messages : Having a strong and healthy relationship with every member of your family is very much essential. 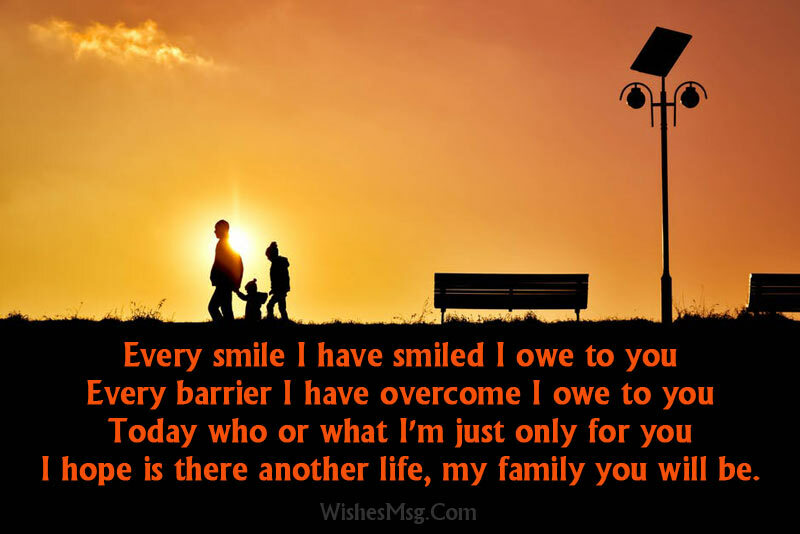 Most often sharing inspirational family messages helps to boost the bond as the good family quotes do. 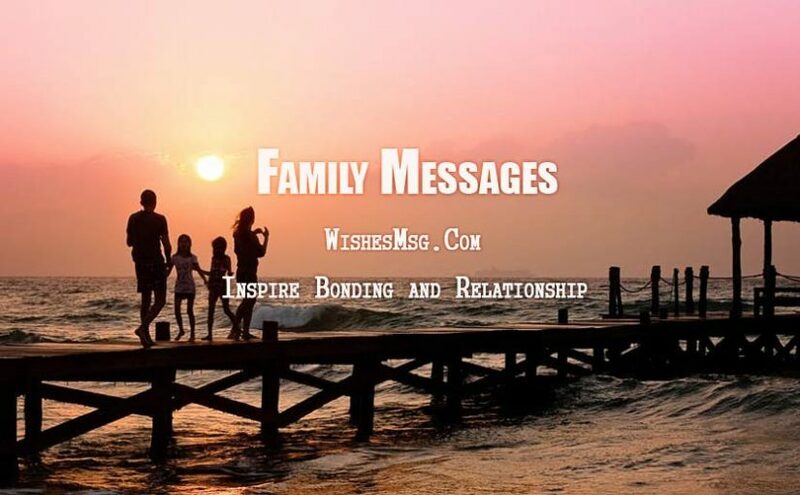 It doesn’t matter whom you want to send family bonding message to your parents, siblings or any other members, here we have various messages for the family you will find helpful. What do you want to inspire your brother or sister, thank your father or mother, even show the love you have for your family? This page contains the best family messages what are supportive and suitable for keeping a healthy relationship between family members. I’m never afraid of dying because I have already been to heaven that is my family. The only perfect place where I feel most content for being. I never understood that I have such a lovely family. Thank you for being there by my side at my hour of crisis. The journey through the difficult time was easy as you all were there with me. You sacrificed your own happiness, just so that I could be happy. It may take a lifetime, but I’ll do everything to repay for what you have done for me. I really appreciate the way my family members have come out from a difficult situation and feel lucky to be a part of this superb and loving family. I am truly blessed to have a family which I have. No matter what, I know all of you will always be there to guide me and help me. The greatest happiness is family happiness. I’m happy for being with you. You push me forward to reach my goal, you lift me up to fill my soul, It’s your love that makes me whole. Where there is a happy family like ours hardly there is need of friends. I really feel blessed and proud to be a part of yours. We are lucky for that we were meant to be a happy family forever. May sadness never touches us, may the hands of God restlessly bless us. As long as it’s about our family happiness, I hope it will be infinite and endless. I wish a wish for you. It’s a wish I wish for few. The wish I wish for you is that all your wishes come true, so keep wishing as my best wishes are always with you. I have got an earlier heaven within my happy family. I have lived a life with them the test of freedom. If it from the rest of the world. Happiness is being contented with what you have, living in freedom and liberty, having a good family life and good friends. I have learned to enjoy every minute of my life being happy especially for my family. No one has a perfect family, but mine is perfect for me! People come and go in our lives, but a beauty of life is that our family is always there. Life is best when you have a loving and caring family and I feel absolutely fortunate to have such a family. Life seems perfect for you people around. Hope we always stay together. Bond is stronger than blood. The family grows stronger by the bond. Every smile I have smiled I owe to you, every barrier I have overcome I owe to you. Today who or what I’m just only for you. I hope is there another life, my family you will be. May the sun always shine upon our family; may the bonding of us be certain to follow. Together we live the life forgetting all hues and sorrows. I will never be able to describe in words what my family means to me. If anyone wants to know, they will have to go inside my heart to see. 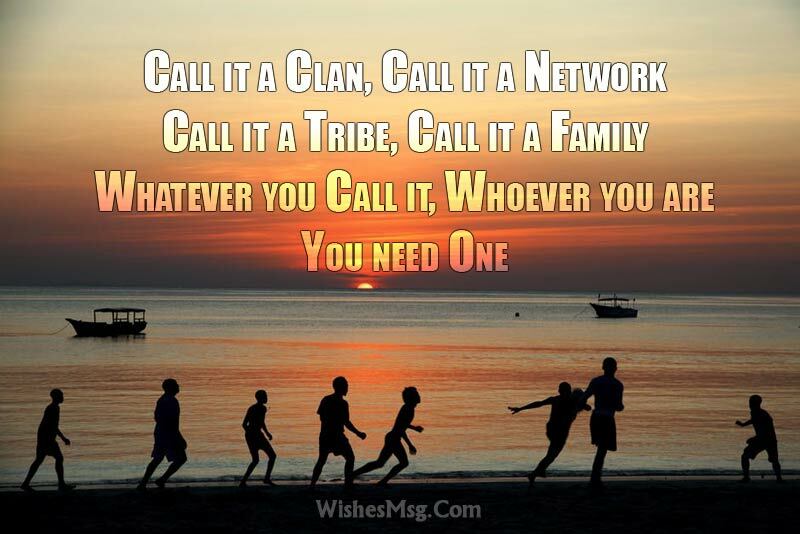 Families and friends form some of the closest of bonds you will ever experience. It is almost impossible for you to lead a happy life without support from these important groups of people. To my family, you are my strength. You have been standing beside me in thick and thin that inspire me to do great things. I really appreciate our healthy family relationship. Admit it or not, in our family we are friends. Each of us is one another’s best friend. 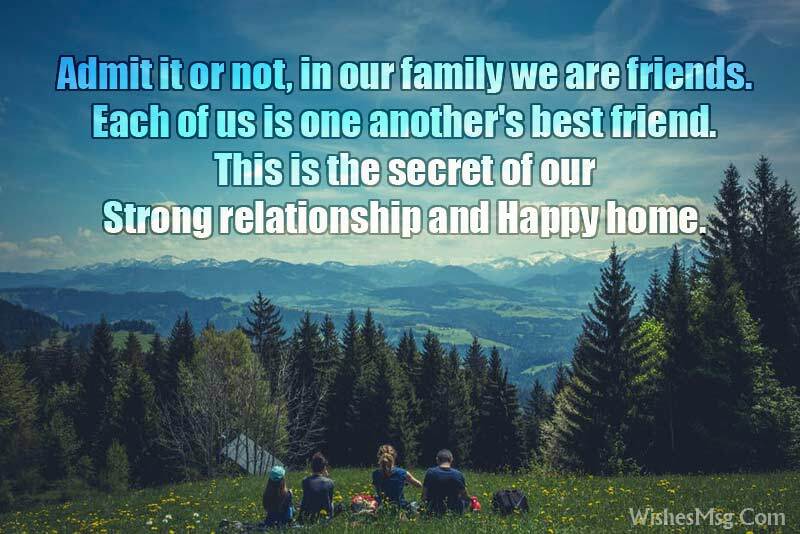 This is the secret of our strong relationship and happy home. It’s very important to prioritize. I know, for me, my family comes first. That makes every decision very easy. I believe a hug can change the world. Maybe not the whole world, but a hug can change the world of a family member or friend. One of the things that bind us as a family is a shared sense of humor. I’m a minimalist. I don’t really need much to enjoy a good holiday – just my family and the bare essentials. I’m the richest man ever in this entire world because I have all of you as my family. Thank you for everything you’ve done for me. I love my dear and lovely family! Families are forever Because wherever I go I miss them. Because whatever I do I need them. Because whoever I love I love them most. My priority is to hang out with the ones I love – my family, my loved ones. My love to my family is warm, cute, caring and sweet – it is all that my heart needs to beat. I love my family most among other things. Expect for true love because there is nothing that could bring a real sense of security into the family. Everyone expects a happy family. Who don’t belongs to a happy family they should work to create one. 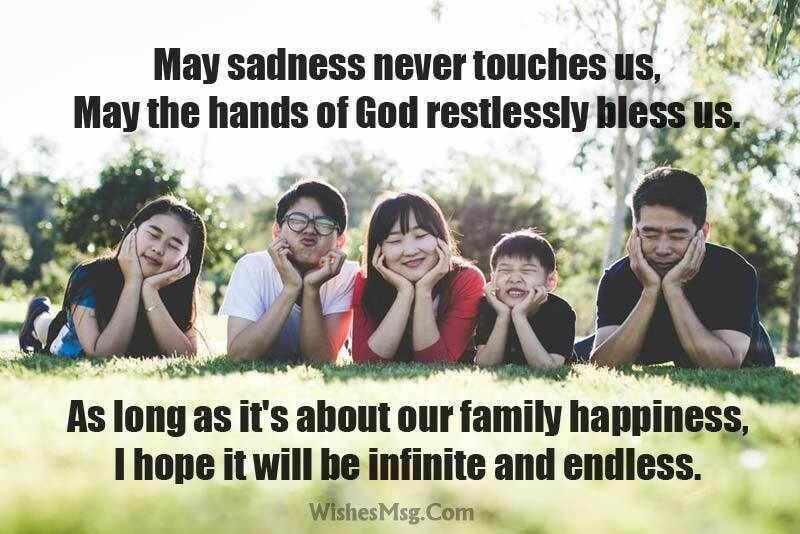 Hope these family messages will be your ways to improve family relationships, strengthen bonding and inspire all the members. Happy reading!